Since putting this page together as a training course for a specific group in the UK, it has been viewed by a wider audience, and I have gotten a number of suggestions on content to add. Thank you for these - I have now made all the suggested updates received. I love the comments, so feel free to continue sending them. Also, if you like the site, you can "like it" on facebook by clicking the icon at the top of the page. Welcome. This course was designed on request for personnel who will potentially come in contact with rabies infected animals. Course Evaluation *Please complete the survey at the end of this course - your comments will be used to make improvements and are greatly appreciated. There are seven lyssaviruses, all of which are capable of causing encephalitis with clinical signs or symptoms of rabies, but 'classical rabies' is caused by Rabies Virus, genotype 1. Rabies viruses are bullet shaped, contain a strand of RNA, and glycoproteins are among the 5 proteins they produce, which coat the surface of the virion and facilitate fusion with host cells. Rabies Transmission: Virus is transmitted to a susceptible host - virtually any warm blooded mammal - through punctures from bites or through scratches or abrasions. Rarely transmission may be through infected saliva or neural tissue contacting eyes or mucous membranes. Infection through transplantation of infected organs has also occurred. Where is the virus? It is present in salivary glands and moves through ducts to the saliva of the infected animal. From wounds in the skin, virus reaches peripheral nerves in skeletal muscle at neuromuscular junctions, and once gaining acces to nerves through motor end plates, travels toward the central nervous system via axons, reaching dorsal root ganglia. The virus proceeds into the spinal cord and brain. Multiplication of the virus takes place in neurons within the brain, and virus crosses neurons in the CNS through dendrites and presynaptic terminals at chemical synapses. Negri bodies form within neurons and neurologic clinical symptoms appear. *It should be emphasized that some species can begin shedding virus in saliva intermittently before clinical signs of disease. In this later stage of the disease, virus spreads centrifugally to organs that are highly innervated, particularly salivary glands. Clinical signs progress to include: agitation and aggression (furious presentation), depression and paralysis (dumb presentation), altered behavior, vocalization, muscle spasms (cause of hydrophobia in people), hyperventilation, hypersalivation. Development of clinical signs will be faster the closer the site of transmission is to the head. Rabies signs mimic those of other neurologic diseases. Canine distemper virus infection, as shown in the raccoon video above, cannot be differentiated from rabies based on clinical signs - these diseases often have the same presentation. Once the virus reaches the central nervous system the incubation period is over; PEP will likely no longer be effective. The video collection pulled together and provided here is intended to emphasis the wide spectrum of species effected by rabies, and the appearance of clinical signs - it is limited by availability and free web access. A nice viewer of this page suggested a video of rabies in sheep/goats would be useful - I will keep my eye out and if you happen to know of a link to one please pass along! Severe neurologic signs typically last 2-10 days. There is no cure or effective treatment for rabies once clinical signs begin, and rabies is almost always fatal. However, after exposure there is a window of opportunity to prevent clinical disease because of the protracted period in which the virus travels to the central nervous system - thus following exposure "post-exposure prophylaxis" (PEP) also called post exposure treatment (PET) must be started as soon as possible. Immediately wash the wound with soap, water, and some sort of commercial antiseptic solution such as iodine; this has been shown to decrease the likelihood of transmission of the rabies virus. In most countries PEP will be one dose of immune globulin followed by four doses of rabies vaccine over a 14-day period. Doses of rabies vaccine should be given on days 3, 7, and 14 after the first vaccination. 2. Rabies virus infections in the UK and EU. In 1920 Classical Rabies was eradicated in the UK; Human rabies deaths in the UK since 1920 = 15. The "Rabies Free Status" the UK enjoys specifically refers to an absence of classical rabies; so which rabies viruses are endemic in the UK and the EU? European Bat Lyssavirus (EBLV) is present in the UK and in multiple countries in the EU; in the UK the viruses are usually found in Daubenton's bats. There are two types - EBLV-1 and EBLV-2 (both have been identified in the UK). These viruses are well adapted to bats, and are believed to only rarely infect other species - reports of this occurring include: five sheep in Denmark, a stone marten in Germany, two cats in France, and in the UK and Europe human infections have been reported in Finland (n 1), and in 2002 one person who worked with bats in Scotland died from infection with EBLV-2. Rabies virus genotype 1, classical rabies, is endemic in several eastern european countries, and is sporadically reported in animals in many more. In 2012 rabies was reported in animals in: Albania, Belarus, Bosnia, Croatia, Greece, Lithuania, Macedonia, Moldova, Montenegro, Poland, Romania, Serbia, Slovenia, Spain, The Netherlands, Turkey and Ukraine. The countries in bold, plus Italy, had greater than 100 animal cases reported between 2010-2012. The map to the left (WHO 2008) shows the levels of rabies risk in European countries. The following link, and the graph below it, provide details on imported animal cases of rabies identified in Europe in recent years. 1977: Rabies cases in animals were reported in the thousands in Austria and Germany, and 755 cases were reported in France. 2005: German outbreak predominantly in foxes in which 25 rabid foxes were identified on the border of Belgium, France and Luxembourg - countries responded with air-dropped and hunter-placed vaccine baits; In the same year 3 people in Germany died after receiving infected transplanted organs from a woman thought to have spent time in India. 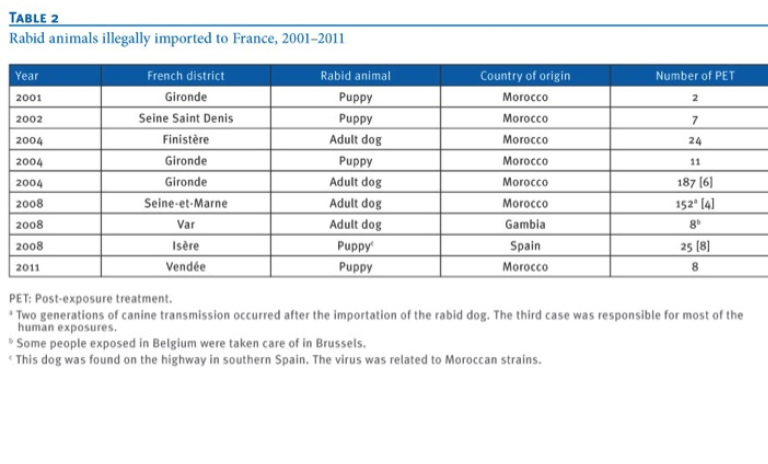 2008: France loses non-bat rabies-free status with the importation of a rabid dog from Morroco, and regains non-bat rabies free status in 2010. 2012: Greece loses rabies-free status with identification of an infected fox believed to have moved across the border from Macedonia. Now that we have an understanding of how rabies is distributed in the UK and EU, this section will provide a broader review of rabies across the globe. Understanding endemic rabies viruses and having an appreciation for rabies on local borders is necessary, but rabies cases will increasingly present in people or animals traveling to and from virtually anywhere, thus medical personnel need to be prepared to recognize imported infections - for a case example click here: Human rabies case in the UK in May 2012 - woman bitten by a dog in India. Anually India reports some of the highest human fatalities caused by rabies worldwide - 85% of all human rabies deaths between 1995 and 2004 were reported to have occurred in India (21,404 deaths/year). The statement above is illustrated in the map shown on the left, taken from worldmapper. 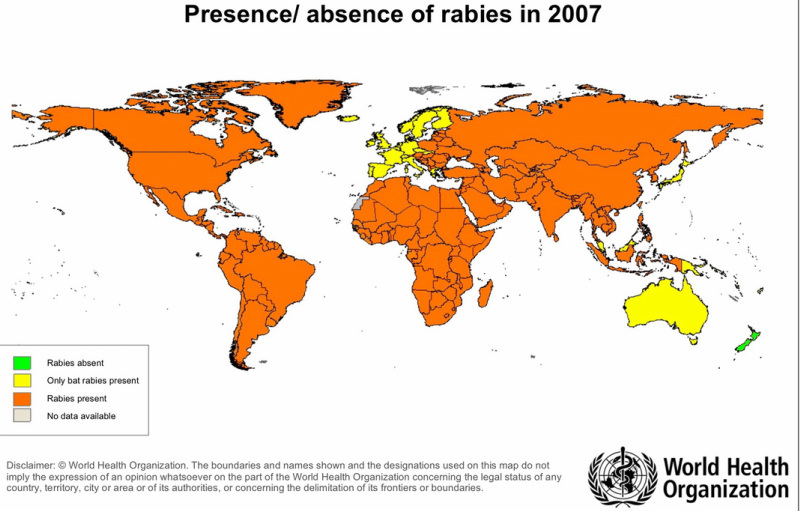 The yellow territory includes India, highlighting this geographic focus of human rabies fatalities. Bat Lyssa viruses are discussed above in the UK and Europe section, but as a reader has pointed out, similar viruses, incidents of human infection related to contact with bats, and vaccination precautions for those interacting with bats exist in Australia, and indeed in a number of other countries. Human deaths due to infection with bat lyssa viruses have been reported in Australia (2 deaths and one infection on last check - March 2013), which has "rabies free status" like the UK, and in the former Soviet Union, where classical rabies is also endemic. Pre 1995, based on review of archived materials, there does not appear to have been bat lyssa virus in Australia, but the first report of the virus came in 1996 when a human infection occurred. The appearance begs the question where did ABLV come from. There are two known forms in Australia, one circulating in flying foxes and the other in insectivorous bats, and serologic surveys have found a close relative in the Philippines. All rabies vaccines are killed. Examples: Nobivac® : For dogs and cats. * Primary vaccination may be administered at an earlier age than 3 months (minimum in dogs and cats of 4 weeks of age), but then a repeat vaccination must be given at the age of 3 months. Can be used during pregnancy in dogs. If the animal is a pet, vaccination status will determine how local veterinary and public health authorities proceed. In a fully vaccinated animal that has bitten or scratched a human, the animal will be quarantined and monitored for 10 days, but this can be done at home. If the animal does not exhibit rabies symptoms during the quarantine period this rules out the possibility of rabies transmission - it will be revaccinated against rabies and released from the quarantine. If the animal is not vaccinated or the vaccination status is not known, the requirements are the same as outlined above for a vaccinated animal, except the animal must be quarantined for the ten day observation period at an approved isolation facility (veterinary clinic, humane society, pound). In either case, If the animal does exhibit signs of rabies, state statutes usually require that the animal be humanely killed and sent for rabies testing at a certified laboratory. If the animal is a wild animal, local animal-control authorities will attempt to capture the animal and submit it for rabies testing at a certified laboratory. Bat exposure that results in rabies transmission does not necessarily occur with a detectable bite, so it is generally recommended that bats found in households where human contact may have occurred also be tested for rabies. Rabies infected animals, live or dead, are potentially infectious and contact should always be avoided. Recommendations for the general public in cases of suspect rabies infections are obviously to not touch, approach or kill the animal, but instead to call local authorities and leave capture and euthanasia to those trained in appropriate handling and PPE. People working in animal control, veterinarians and veterinary technicians, and laboratory personnel are at increased risk of exposure - whole heads are often requested for submission to diagnostic laboratories for rabies testing, and veterinary clinics are often charged with overseeing quarantine. For people occupationally exposed to scenarios in which infected or potentially infected animals must be handled, training in wild animal handling and restraint is essential, and basic precautions when handling animals, carcasses or tissues include covering cuts, abrasions, or rashes by wearing protective gloves and clothing, guarding against cuts, bites or scratches, thoroughly cleaning any skin surface should it come in contact with the potentially infectious material, and guarding against aerosols with masks and protective eyewear. Lapses in protection must be dealt with immediately - contact points (bites, scratches) should be flushed with water for several minutes, followed by use of detergent, followed by treatment with an alcohol or iodine-based disinfectant. Once the exposure site has been cleaned, further medical advise needs to be sought and may vary depending on a number of factors including vaccination status of the individual and the animal. Clothing should be treated as contaminated, bagged, and washed separately. Click here for a link to recommendations for handling postmortem tissue infected or potentially infected with rabies. Classical Rabies Testing: The direct immunofluorescence antibody test (FAT) is the primary test used to diagnose rabies. It is performed on fresh brain tissue with examined regions being species specific in most labs. Virus isolation and mouse inoculation (MIT) are also used. EBL Testing: In several reports the inability to identify Bat Lyssaviruses using standard rabies protocols has been pointed out and a lower level of antigen in brain tissue theorized as the reason. In the case of two cat infections in France, authors indicated that only one was FAT positive, and that the second was negative using the three standard testing modalities described above. This cat was diagnosed using an antigen capture ELISA followed by RT-PCR. Click here to read article on a lentiviral pseudotype neutralization assay for serosurveillance. How will rabies present in Jersey?